Dr. Lekha Chakraborty, Associate Professor, at NIPFP has joined as Visiting Professor, the Centre for Gender Research, Uppsala University, Sweden. 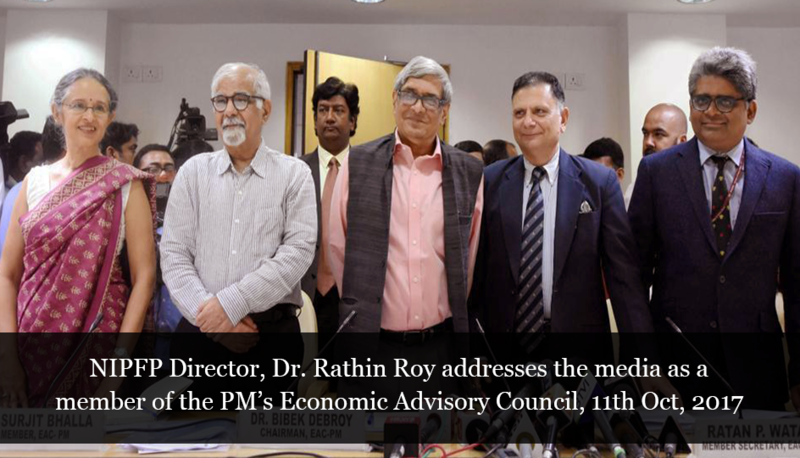 Dr. Rathin Roy, Director, NIPFP has been appointed as part-time member of Prime Minister's Economic Advisory Council (EAC-PM), Government of India. The council is headed by Bibek Debroy, Member, NITI Aayog. Ratan Watal, NITI Aayog’s principal advisor and former Finance Secretary is the member-secretary of EAC-PM. Surjit Bhalla, Economist and Ashima Goyal, Professor, IGIDR are other members of the council. Dr. Rathin Roy, as a member of the EAC-PM addressed the media on October 11, 2017 (see group photograph). Prof. Pinaki Chakraborty has been appointed as the Chairman of Public Expenditure Review Committee, Govt. of Kerala, constituted by the order of Governor of the State. The Public Expenditure Review Committee is formed under section 6 of the Kerala Fiscal Responsibility Act of 2003(Act 29 of 2003). The mandate of the Committee is to analyse the own revenue receipts (tax and non-tax resources), fiscal transfers from the Central Government, public expenditure - revenue and capital, fiscal devolution to the third tier (local self governments), public administrative spending, public deficits (revenue, fiscal, primary), capital budget (receipts and expenditure) and the public debt of the State; and to provide fiscal policy recommendations. Dr. N.R. Bhanumurthy, Professor, appointed as Member, Advisory Committee on National Accounts Statistics (ACNAS) for a term of five years. Click to here for government notification. Shri Sumit Bose, Vice Chairman, NIPFP and Dr. Rathin Roy, Director, NIPFP have been appointed as members of a review committee to give recommendations on the FRBM (Fiscal Responsibility and Budget Management) roadmap for future. The Committee shall submit its report to the Government by the 31st of October, 2016. Dr. Vijay Kelkar, has been appointed as Chairman NIPFP from 1st November 2014. He is a distinguished economist, and has served in various senior positions of the Government of India. He has been the Chairman of the Thirteenth Finance Commission, Finance Secretary of India, Petroleum Secretary of India, Advisor to the Union Finance Minister, and Executive Director of India to International Monetary Fund (IMF). He was awarded the Padma Vibhushan in 2011. Dr. Rathin Roy, Director NIPFP has been appointed as a member of the Expert Committee constituted by the Government of India to identify the new Capital for the successor State of Andhra Pradesh. Dr. Ila Patnaik, RBI Chair Professor at NIPFP, has been appointed as Principal Economic Advisor in the Ministry of Finance, Government of India. Dr. Rathin Roy, Director NIPFP, has been appointed as part-time member of the Seventh Central Pay Commission constituted by the Government of India. Dr. M. Govinda Rao, former Director NIPFP, and Dr. Sudipto Mundle, Professor Emeritus NIPFP appointed as members of the Fourteenth Finance Commission constituted by the Government of India. Dr. Pinaki Chakraborty, Professor NIPFP, has been appointed as the Economic Advisor to the Commission.